She’s the newest, and first addition to the LAQ line of skins, and now, mesh heads. Currently, I have her paired with the equally new Camille, in tone 1.0. By default, Trinity comes with the Wilma skin, which is also available in the mainstore and comes with a much larger range of options than the others. When I first put on Trinity, I was completely torn. I loved the lips, loved the cute button nose and adored the shape of the face and jaw. But, the eyes are just too squinty for me and the face a little too wide. Unfortunately, Trinity isn’t rigged, which means that unlike most mesh heads, you are not able to make small adjustments using the head stretch/length sliders. (Though you can adjust the head size.) Definitely a bummer. Nevertheless, I played around with the suggested slider settings (available in an included notecard) and added my own personal touches. 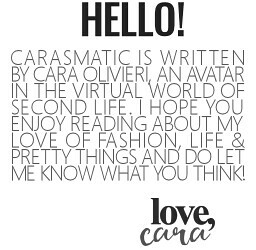 After trying on the available appliers, I settled on Camille as she felt the most like me, but I am definitely disappointed that for L$990, all I received was a basic skin tone with one brow color (med/dark brown) and a small hud for eyeshadows and lipsticks (seven each.) Though the skin is lovely, I was definitely hoping for more options. Trinity’s hud is very simple and well organized. As I mentioned, Wilma is the default skin and while you can scour the grid searching for Omega compatible options for brows and makeup, you can still use the hud’s default options over your other skins. Another great hud feature, is the option to choose your head size, which will automatically adjust your lashes and eyebrows to fit your head, saving you the hassle. You can also change the length of your lashes with a simple slider and apply tints to each category, including brows, hairbases and makeup. The second tab of the hud is for expressions and while there aren’t as many options as say, Catwa or Logo, the ones offered are still really nice. I love all of the multiple options for the varying degrees of parted lips, for which I am a huge fan. There is also a play button, which can rotate through all of the stages, or a ‘skip’ button which allows you to remain on a static stage of the animation. This is definitely great for photographers. Lastly, one of the biggest flaws I noticed while trying on hair today, was that about 40% of everything I tried- didn’t fit! To me, it appears as if the egg head and forehead angle of the design itself could use some fine-tuning, though this would hardly be necessary if the head were rigged. Fortunately, most hair creators offer multiple size options in their hair packs, but for those that don’t, it can be frustrating. 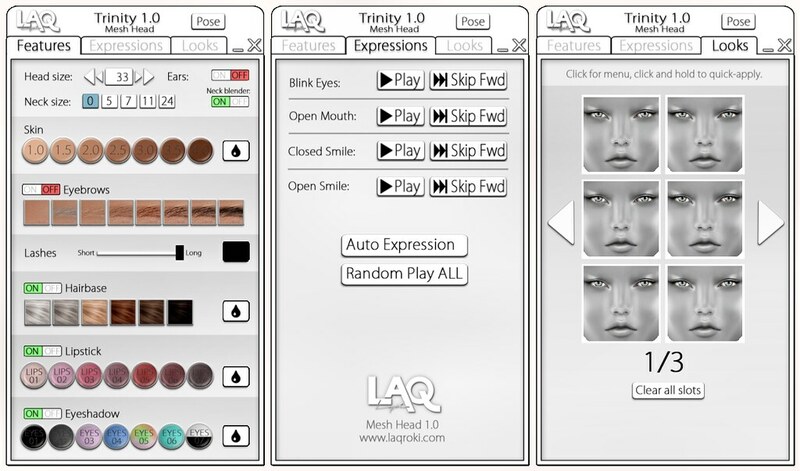 Overall, for a first mesh head I think LAQ is onto something good and I look forward to seeing what the updates and future new releases will bring. 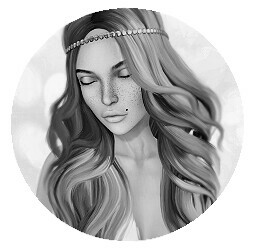 I, for one, am definitely hoping for more eyelash and skin options, as well as some kind of layer that will allow for freckles and blush appliers for the entire face, among others. Though it will take some time for other skin creators to get on board in creating for Trinity, if at all, I am excited to see what happens next. What are some of the features you’d like to see on the next release? Lack of options for available appliers. No full face makeup appliers. L$3100 + L$990 per applier for one brow tone.